Better late than never, I was going to post this entry back in July. This Fourth of July I was visiting my parents and I played some games with my dad. 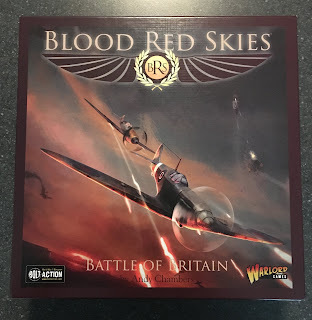 I picked up a copy of the WWII dogfighting miniatures games Blood Red Skies. 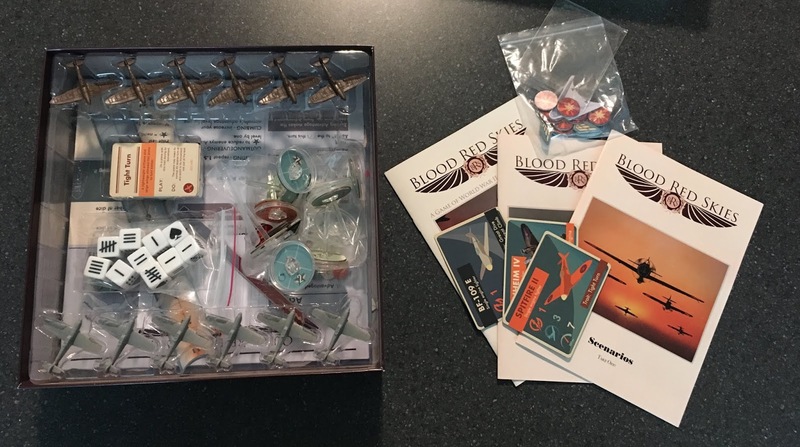 Specifically, I acquired the Battle of Britain beginner set. The beginner box cost $50 at my dad's FLGS. I asked a couple of questions of the store owner about the game and his answers helped to sway me to make my purchase. I asked if there was any model assembly required (There is not, the airplanes just pop into the custom bases) and what the required table size was (whatever you got, dinner table is fine, his group played on 4'x3'). Your $50 buys you the base game which comes with 12 airplane miniatures, custom stands, rulebooks, dice, measuring tools, cards, tokens, punch out clouds, and everything else you need to play the game. The miniatures come in two sculpts. You get six Spitfire IIs and six BF-109 Es. The models are unpainted but they are cast in colored plastic. The British planes are brown and the German planes are grey, so you don't need to paint them if you don't want to. You also get a couple of bombers represented by flat cardboard tokens. I have not played the scenarios with the bombers yet but it is nice to have the variety. I definitely felt like the box is a good value. The quality of the components is very good. The cards have a nice linen finish, the cardboard tokens a feel thick and sturdy, and minis look great. The custom stands move as intended and the custom dice, with etched tally marks for numbers and an ace symbol for sixes, are great. The box is compact, measuring 10 1/4" square and 2 1/2" high, so it is not an inconvenience to carry it to my local game group. Blood Red Skies has a unique approach to representing airplane combat on the tabletop. Each airplane has a special stand that is designed to tilt back, stand straight, for tile forward. These positions correspond to the aircraft being advantaged, neutral, or disadvantaged. 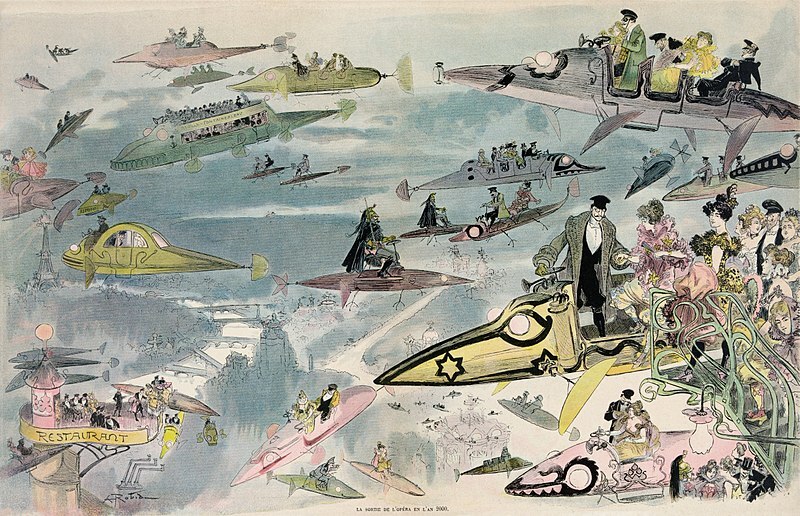 These positions are an abstraction that represents a combination of the plane's altitude, moxie, and location. An airplane needs to be in a superior position to its target in order to shoot at it, and an airplane can downgrade its position on purpose to gain speed or maneuverability. It is an interesting mechanic that plays fast. I found the game to be playable and fun. The rulebook is short and my dad and I were dueling very quickly after opening the box. The models look nice on the table as is, although I could see myself painting them one day. I would recommend this to someone looking for a casual dogfighting WWII game. I Played a Miniatures Game and I Liked It! I like to play all types of games. I play board games, card games and CCGs, role playing games, play-by-mail games, and a few video games. One genre of game that I have always wanted to try out are miniatures games. I own several unpainted figures and rules, and I have even dabbled in Heroclix (which I define as a board game with miniatures, but that is for another post). The type of game that I am talking about involves moving figures around a table, measuring distances with tape measures, and looking on as the modeled terrain and painted minis create a gestalt of a tiny battle. Last week I played Fate of a Nation, a variant for the popular Flames of War rules that covers the Arab-Israeli conflicts. This was not a conflict I ever thought of simulating. 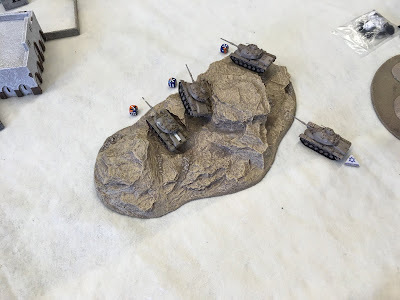 However, I found a local wargamers club and one of the members graciously offered to bring his tank models and rules so that we could have a battle. Setting up the table for the a desert battle. It was awesome that I could participate in a game that had painted models and ready-made scenery and terrain. Most of my own miniatures projects are languishing in the closet because I was overwhelmed with all the steps required to create a decent looking table battle. Another great aspect was that the owner of the models agreed to be referee between myself and another player. He explained the rules throughout the whole game, allowing me to focus on tactics and strategy rather that the minutia of an unfamiliar set of rules. UAR forces prepare for their assault. Israeli tanks hide behind a hill, waiting for battle. I did not come totally unprepared. I brought dice and a small tape measure. The game was a blast (no pun intended). I played the Israeli side and I have two teams of tanks staring down a mass of invading enemy tanks. The referee explained that this was a classic case of one side having lots of numbers while the other side had less equipment of a better quality. My strategy was to roll my tanks to the edge of cover, fire, and then retreat behind the cover for protection. The Israeli units have a special ability that gives them an extra move as long as they make a roll. The downside to my plan was that my tanks could get bogged down in the covering terrain or they could fail their roll for extra movement. This would leave them stuck or exposed to enemy fire, and since my total number of tanks was seven any losses that I took would hurt. My tanks in firing position at the edge of the woods. My other unit of tanks. Notice that one tank failed to navigate the hill and is bogged down. My strategy worked well, mainly due to good rolls of the dice. I was able to pop up and back, taking shots at the advancing enemy. I hit many UAR tanks, causing at least one failed morale check that sent a bunch of units running. While a few of my tanks were hit, they we only bailed out and recovered on the next turn. I won the scenario by destroying all the enemies tanks or causing them to leave the battlefield due to failed morale checks. I would like to try a scenario where the Israelis are forced to take a more proactive role on the battlefield. I can already feel the tension imagining a unit of three tanks maneuvering through a battlefield while 20 plus enemy tanks fire on them. UAR tanks taking casualties as they charge the Israeli positions. I had a ton of fun and definitely want to try Flames of War again. I liked the system and I liked playing a tank battle. I might look into the Team Yankee rules for Flames of War, which covers a hypothetical WWIII in Europe between NATO and Soviet Bloc troops. Overall it was a great game and I will need to get some tanks and paints! I am a fan of unusual role-playing games. I recently acquired a copy of the first edition of De Profundis; Letters from the Abyss, A Game of Mind-warping Horror in the Style of H.P. Lovecraft. The game is credited to Michal Oraz and was translated from Polish to English by Maja Apollonia Pica. The book is a 32 page saddle stitched book with glossy cover pages and black and white interior pages. De Profundis is a role playing game that asks, "How would you like to play a Lovecraftian LARP by sending letters through the mail?" This is a review of the first edition of the game which is currently out of print. There is a second edition that was published by Cubicle 7 Entertainment. The second edition is available as a pdf from rpgnow. As far as I know the second edition contains most of the text from the first edition along with some expanded content. De Profundis is written in a meta style. The text reads partly like instructions for a game and partly as the diary of a character plunging into madness. 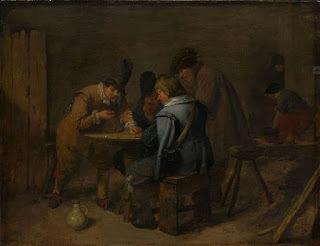 The narrator of the rules describes his descent into madness as he tries to decipher a text. I thought that this style fit the game well, as the rules of the game encourage the players to try to live out their character's madness through letters. To play De Profundis a player creates a character and then writes a series of letters to someone from the viewpoint of that character. The person that you are corresponding with writes you back from the point of view of their character. 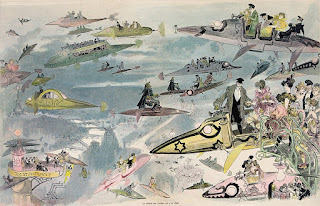 The rules discuss creating characters either in the 1920s or the modern era. The author points out that there are many famous horror stories that are told using letters, such as Dracula, and shows how letters play important roles in Lovecraft's own tales. The characters are meant to mimic the types of people who exist in Lovecraft tales, i.e. normal people who begin to notice the horrible lie of reality around them. The author of De Profundis describes an unusual method for making sure that your character is in the mindset of an unhinged Lovecraft protagonist. The technique is to observe the word around you, and then slowly use your imagination to allow snippets of illusionary horror to creep in. Go ahead and space out on the bus, did that passenger who just got off look like an alien? It is a type of method acting where you let your mind slip into the unhinged reality of a Lovecraft character and see your world through their eyes. The writing style of the rules helps you get into this mode as the author writes many sections from this viewpoint. The author gives players some structure and rules for making characters and writing and sending letters. He gives suggestions for how the framework of the game should function as well as guidelines on how characters should interact via their writing. One thing that I liked was that the author emphasized the importance of physically writing letters. I believe that the second edition of De Profundis has rules for using email, which I think would take a lot of the soul out of the game. The book has two appendices. One has a character sheet and information on how to join "The Society", which was a database of De Profundis players. I use the past tense because I believe that this information is out of date. The second appendix is an article on psychodrama, which is a type of improv larp. It is obvious that the author is a fan of psychodrama and that it heavily influenced De Profundis, so it is worth a read. Overall, I really like De Profundis. The game has more than a hint of mystery. There is enough missing from the rulebook to let your imagination run rampant, and there is enough of a framework to provide ample inspiration. 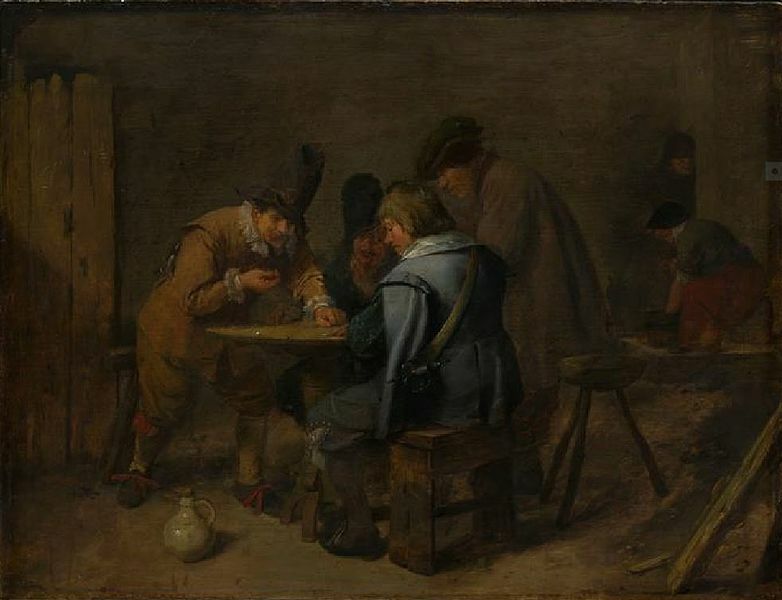 The most difficult part of the game would probably be finding players who are willing to actually put pen to paper and send letters through the mail. I have started a game with one player and it has been enjoyable. If you are a fan of Lovecraft, writing letters, or bizarre games that are off the beaten path, then I recommend De Profundis. I grew up reading gaming magazines. My dad had a subscription to The General, Avalon Hill’s house magazine. I would pick up issues of White Dwarf and Autoduel Quarterly from the game store and devour them. I have been pleasantly surprised to find out that there are a large number of game magazines that are published in digital format and that are released for free on The internet. One magazine that I have found is Warning Order. 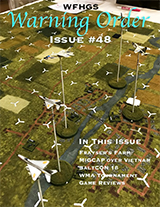 Warning Order is a free magazine published by the Wasatch Front Historical Gaming Society. They have just released issue 48, and their entire backlog is available for download from their website. Warning Order focuses on miniature wargaming and board wargames. Each issue usually has some battle reports, game reviews, and other miscellaneous articles. One cool feature that started in issue 36 is the inclusion of scenarios for miniatures games. I also enjoy looking at all the pictures of painted miniatures set up for battle.